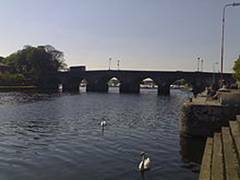 The Shannon is the most famous river in Ireland and at 386 km (240 miles), is the longest river on the island. It divides the west of Ireland from the east and south. The river is a major physical barrier between east and west. The origin of the name comes from the name of the Goddess associated with the river, “Sionna”. The Shannon has been an important waterway since early times. It was mapped by the Graeco-Egyptian geographer Ptolemy. The river flows southward from the County Cavan before turning west and ending up in the Atlantic Ocean through the 113 km (70 mi) long Shannon Estuary. Limerick city stands at the point where the river water meets the sea water of the estuary.